Home ▸ Bear Hunting ▸ Should I View Graphic Bear Hunting Pictures? Many sites have graphic bear hunting pictures. These pictures are bloody and depict actual kills with the hunters that felled them. 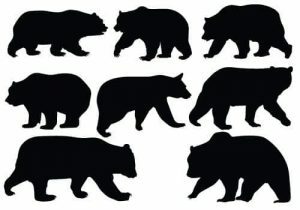 These pictures can also depict the size of the bear quite easily. Some of the online pictures show how large grizzlies really are, by using their pelt and the number of people standing side by side in the pictures. In one picture, there is a hunter holding one paw of the bear. He is holding it in two hands, and could easily fit another one between. The paw is larger than the size of his face. There are other hunting images that show the rifles that the hunters used to harvest the bears. With the number of pictures online, hunters have a fair idea of how big these bears can get. Another site shows a picture of a polar bear, still bleeding but dead. This picture also comes with a story of how the bear was shot after it attacked a sleeping hunter in his tent. The man is, according to reports, lucky to be alive after being the victim of a bear attack. You can even buy bear hunting pictures on DVDs. These DVDs have videos and pictures of bears as they are being hunted and after they have been harvested. They will show the size of the bear, how to properly cape and blood the bear. These videos are quite inexpensive, and because they are targeted to a specific market, available online only. These bear hunting pics and videos are not for everyone to view. If you are not a hunter or are against hunting, then you should not view them. These videos and pictures are very graphic, with a lot of blood and internal body parts. These pictures are obviously not for the feint of heart. Good photography show the hunters only what is necessary the kill, the size of the kill in comparison to the hunter, and the pelt, after it has been cleaned properly. They may seem boring, but that is all that is necessary to show. Showing other all the other things is, from a non-hunter’s point of view, disgusting and unimportant. As a hunter, you know doubt know that graphic bear hunting pictures are all over the internet. However, your fellow hunters would probably have some interesting pictures that they would be happy to share with you. Your photos can be used as educational tools when it comes to educating those who do not understand the thrill of hunting. Share your bear hunting pictures with your fellow hunters and show others that hunting is not the horrible, disgusting thing that animal rights activists think.